As the final days in February draw to a close, it is very clear that there has been no week that has matched the intensity and excitement that this past one offered. With the playoffs just over a month away, every team is preparing for the road ahead. 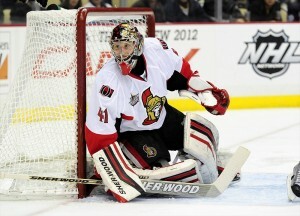 Teams on the bubble are making the final push to the playoffs, such as the Phoenix Coyotes and the Ottawa Senators. Contenders such as the New York Rangers and Detroit Red Wings are securing their divisions, and the basement dwellers such as the Columbus Blue Jackets are preparing for the draft in June. The past week also saw its fair share of individual feats achieved, including strong efforts from Erik Karlsson, Daniel Sedin, and Kari Lehtonen. However, the bevy of activity that occurred overshadowed individual statistics and changes in the standings. With the trade deadline approaching, teams began to focus in on their targets, and stating their title as a “buyer” or “seller” on Monday. “The Week That Was” will focus on all of the past week’s activities that were not present in the boxscore. This includes some weird injuries, re-signings galore, trades, and much more. Here is “The Week That Was” for Sunday, February 19th to Saturday, February 25th. The Toronto Maple Leafs have had quite the up and down season. While there have been considerably painful low points, the Buds have managed to put together a fairly successful season, producing offense on a nightly basis and contending for a playoff spot for the first time since the lockout. However, the one area they had not succeeded in was scoring a desperation, game-tying goal in the final minute. However, this all changed on Tuesday night against the New Jersey Devils, when Phil Kessel netted his 31st to tie the game at 3 a piece. Usually, when a player scores with such little time remaining, their team gets an energy boost that drives the squad to win in overtime. However, that did not hold true for the Leafs. Just a minute into the overtime period, Mark Fayne wired a shot wide of the net. Apparently, it was too much for Gustavsson to handle as the puck bounced off of his pad and into the net. This was easily the worst play of the week, especially after the way that the Leafs had rallied to tie the game against the red hot Devils. While the Leafs know that their goaltending is not top tier in the league, NHL goalies should still be expected to stop pucks going wide of the net (especially if they want to make the playoffs). The NHL has seen its fair share of injuries this season. There have been injuries to stars such as Claude Giroux and injuries from blatant headshots like the one sustained by Nicklas Backstrom. However, the most prevalent type of injury this season is the “weird” injury. Whether these took place in practice when Taylor Hall was cut after falling, or outside the rink when Jamie Benn had an appendectomy. Even Dustin Penner was injured eating pancakes, resulting in the NHL’s first injury sustained as a result of eating food. On Thursday, two more injuries were added to this infamous list. The first occurred late Wednesday night, when Senators’ goaltender Craig Anderson cut himself on his blocker hand while preparing a meal after their win against the Capitals. While Anderson is apparently no Iron Chef, he is a rock in the crease. He’s gone for 10 or more days, and his 4 wins in his last 4 games will certainly be missed. The second injury went was courtesy of Jonathan Toews, after he crashed his car into a pole around 10 a.m. central time. Toews, who was already battling an upper-body injury, was taken away in an ambulance without any major injuries. He should be fine and return once his upper body is healed. Regardless, it was an odd injury that is rarely seen in the NHL. It’s sometimes said in sports that an energetic home crowd can create an extra player for their team. Through their enthusiasm, a crowd has the ability to make the home team play better and ultimately win a game. However, on Thursday night that was not the case. Of the 9 games, only 2 home teams managed to be winners. While all but 1 of these home losses were by 1 goal, the visitors managed to take away the advantage and get 2 points from their respective clubs. The Maple Leafs, Red Wings, Predators, and Flames were among the teams that could not seal the victory at their own rinks. The Good- Ales Hemsky is certainly one of the more steady players in the league. Averaging around 0.8 points-per-game, he is certainly a valuable player. He is also a very good veteran presence on a young team. The Bad- To say that Hemsky is injury-prone would be an understatement. The Czech winger has only played 116 games in the past 2 and a half seasons, and has never played all 82 games in a year. Spending 5 million a year for a player that injury prone is very worrisome. Who Wanted Him? Numerous teams were looking at Hemsky, including the Detroit Red Wings and Nashville Predators. Because of this signing, teams interested in Ales will have to find another rental for the trade deadline, perhaps coming in the form of Andrei Kostitsyn or Mikhail Grabovski. Verdict- A slight overpay, but one that was needed. Hemsky is a valuable member of the Oilers, and the extra $500,000 needed to ensure that he remained in Edmonton is important. However, @NHLFlames (the twitter page for the Calgary Flames) didn’t find the signing all too smart. The Good- Ruutu is a reliable point getter and a physical presence. The 28-year-old winger is a hard-working, dedicated guy that puts his body on the line night in and night out. He is a very good influence for the young players in Carolina’s system. The Bad- Ruutu is not the most durable player in the league, and his physical presence doesn’t trump his average point totals. $4.75 million a year for the next 4 years is also quite steep. Who Wanted Him? Teams such as Vancouver and Pittsburgh were looking for the hard-hitting winger to join their team. As a result, the teams will be looking at Steve Ott to fill the gap. 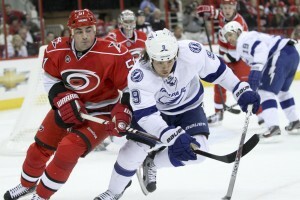 Verdict- Too long and too pricey of a contract for a player like Ruutu. While it was smart for Rutherford to lock him up, it could potentially handcuff the Hurricanes in the future. The Good- Big Bert is a highly durable player that can play many roles. He can score, play physical, be a leader, and participate in the shootout. The Bad- Bertuzzi is now 36 going on 37, and might lose some of his gusto in the upcoming year. The presence of Bertuzzi for the next 2 years also ruins the chances of some of the young prospects, who could potentially land a spot and help the team. Who Wanted Him? There were no rumoured teams in on Bertuzzi, but there were certainly teams that inquired. Bertuzzi gains attention from teams because of his leadership skills. Verdict- Great signing by the Red Wings. Todd Bertuzzi has shown no signs of slowing down, and should help Detroit remain competitive in the Western Conference. 1) Tampa Bay trades Steve Downie to Colorado for Kyle Quincey, who is then traded to Detroit for a 1stround pick. View from Tampa Bay- Tampa continues their rebuild, gaining a valuable 1st round pick. This will be their 6th pick in the first 2 rounds this year. View from Colorado- Colorado trades away a solid defenseman, but have a bevy of young blueliners such as Tyson Barrie and Stefan Elliott ready to replace him. They also gain a scoring agitator. View from Detroit- Gain more stability on the blueline, which is incredibly essential to a deep playoff run (which they intend on having). Who Wins? Colorado. Downie is going to be a very important part of their team for the next little while, as he brings some edge to the team. 2) Columbus trades Antoine Vermette to Phoenix for Ottawa’s 2nd round pick, 5th round pick, and Curtis Mcelhinney. View from Columbus- Columbus continues the firesale by ridding themselves of cap space, and gaining a 2nd rounder. View from Phoenix- Gain more depth down the middle, which will help in the playoffs. Vermette is also rumoured to be a very hard-working player with a great attitude. Who Wins? Phoenix, for giving up relatively few assets to add a player that will help the team try to get past the 1st round of the playoffs. View from Columbus- Columbus rids themselves of a player that really accomplished very little, and never wanted to play there since day 1. They also acquire a very strong offensive-defenseman, and a 1st round pick. View from Los Angeles- Los Angeles picks up a lethal sniper that will help their last place offense. Carter also has chemistry with Mike Richards, which should spark him offensively as well. Who Wins? Both sides, for addressing their needs and giving up a piece that was expendable.